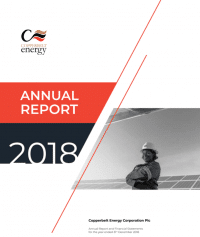 The Directors of Copperbelt Energy Corporation PLC (“CEC”) are pleased to announce the release of the annual report for the year ended 31 December 2017. Below is an extract from the Chairman’s Statement. I am grateful to my fellow directors currently serving on our board for their invaluable contributions and their active participation in setting the Company’s strategy in the past year. I also thank those who stepped down during the year and welcome the new directors. I am grateful for the hard work, dedication and commitment of our Managing Director and his management team. I congratulate them for delivering on the CEC strategy and for presiding over the improvements in financial, operational and social performance recorded in the reporting period. My heartfelt gratitude also goes to all the staff for their efforts, without which we may not be posting this performance. I thank our customers for showing their continued confidence in us through their business.